We offer a modern and newly renovated 2-room apartment that can accommodate 2-4 persons + infant (cot available). In the bedroom there are two large beds (0.90 mx 2.00 m) and in the living room a pull-out sofa bed (1.60 mx 2.00 m). 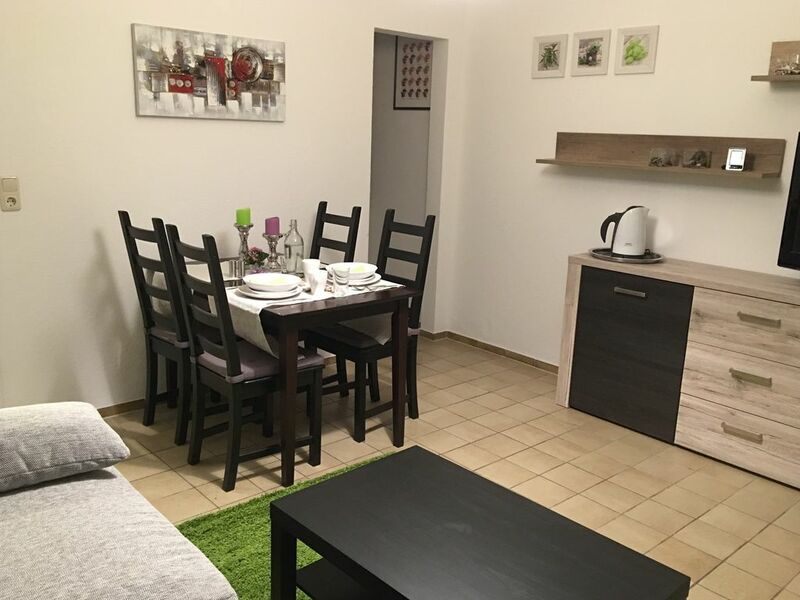 Location: * 10 minutes by car from Lübeck-Altstadt * 20 minutes by car to the beach * 20 minutes by car to Hansa Park * 30 minutes by car to Hamburg Parking, flatscreen TV, multimedia and CD player, radio, wireless broadband internet access and washing machine available. We offer a modern and newly renovated 2 bedroom apartment that can accommodate 2-4 people. On request, we also provide a cot / high chair free of charge. The bedroom has two single beds (0.90 m x 2.00 m) and in the living room a pull-out very comfortable sofa bed (1.80 m x 2.00 m). (intended for permanent sleepers). Kitchen is equipped in div. Cooking utensils: pots / pans, small cooking plate, fridge-freezer. In addition, a kettle, toaster, cafetiere, crockery, cutlery are available. On the terrace garden furniture (table / chairs) and a barbecue are available. The apartment also has a flatscreen TV, multimedia and CD player, radio, wireless high-speed Internet access and washing machine. Wir waren zu viert für zwei Nächte in dieser Ferienwohnung. Sehr freundlich modern eingerichtete Wohnung, hat alles was benötigt wird. Die Vermieterin sehr freundlich und hilfsbereit, wir würden auf jeden Fall wieder kommen. The apartment is located in beautiful Schleswig-Holstein the land between the Baltic and North Sea. 20 minutes by car to the Baltic Sea, Holstein Switzerland and 10 minutes to the historic marzipan city Lübeck. The Hanseatic city of Lübeck offers many attractions in addition to its world famous landmark, the "Holstentor". Parts of the old town, were included in the "World Heritage List". The historic center, with its charming old houses, shops in the pedestrian streets, the island town and the Trave invites you to stroll. In Lübeck you will find culture and entertainment of every kind. The well-known Lübeck marzipan is another "sweet" specialty of the city. The Baltic Sea and Lübeck Bay can be reached in just a few kilometers. The recommended seaside resorts: Travemünde, Timmendorfer beach, Scharbeutz, Haffkrug and Niendorf (with its charming harbor) invite you to relax with their sea promenades and sandy beaches. Scharbeutz offers an adventure swimming pool, the Ostsee Therme. In Sierksdorf there is a family and amusement park "Hansa Park" which is reached in 20 minutes by car. In the immediate vicinity are Bad Schwartau, nationally recognized Jodsole- and Moorheilbad. Holstein Switzerland is the largest nature park in Schleswig-Holstein. Nestling in a gentle hilly landscape and on the large lake district are many idyllic destinations such. B. Malente, Eutin and Plön. The state capital Kiel and Hamburg border (about 50 - 70 km away) to this area.